In recent years the world has seen a surge of populist movements that deny or distort scientific facts. Europe is not immune to these developments as can be seen in electoral results from all corners of the continent, West and East, North and South. 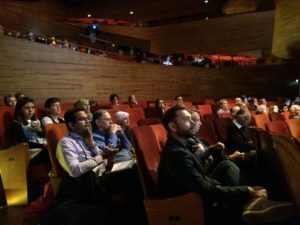 The session will discuss the reasons for these developments and discuss strategies to put scientific evidence back into its rightful place in political and societal debates in Europe. 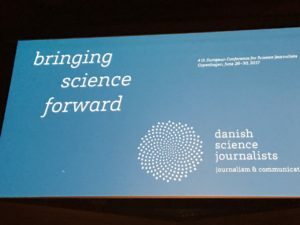 A session submitted to the European Conference of Science Journalists 2017 Copenhagen by the European Commission, facilitated by Johannes Klumpers, Directorate General Research & Innovation, moderated by Wolfgang Chr. Goede, International Science Journalist, German Science Writers TELI, World Federation of Science Journalists WFSJ. The common ground for this session and panel is the International Science March last April. As the moderator outlined in his introduction, “many of us have participated in this in our respective countries”. This is a historic and political landmark. For the first time in history scientists throughout the world took to the streets to demand scientific truth and evidence. The political background: Post-truth and alternative facts, plainly speaking lies attributed to last year’s US presidential campaign, the victor Donald Trump and the current US administration. The has culminated most recently in the pull-out of the US from the Paris climate agreement, denying all scientific evidence that carbondioxide contribute to global warming and needs to be cut down. Parallel to this development in the US is the populist rise in Europe, Hungary, Netherlands, Germany, France and UK: Brexit occurred on not substantiated information, rather emotions than facts and evidence. Overall, western democracies are at risk to fall back into the pre-enlightenment era, not to say into dark middle ages. The statements of four distinguished panelists follow. Today media play an important role in the political environment and it is not always easy to make politics appealing for headlines by pointing out facts and evidence. It became especially difficult in recent years, where some political forces and part of the media became less reluctant to use wrong or partly-wrong information -making a politician’s effort to use accurate research results and facts even more crucial. However, with social media news are spreading much faster than ever before. When fake news articles or any piece of information is posted on Facebook, Twitter, etc. it is basically impossible to revoke it. It can get shared, included in other postings and repeated by anyone, including politicians. Fake news, spread on purpose, do usually not include (too) many scientific facts, but target the emotions of the individual. This is what makes it hard to counter their arguments. People seem not really open to purely scientific and logical arguments. Combing facts with emotions might therefore be one possible strategy to promote a positive image for fact-based policy-making. There are several ways to promote and defend scientific facts in the political environment. It is never easy to change a person’s opinion on a matter though. Especially if it is grounded on an emotional reasoning. However, it is essential for us politicians and policy-makers to base our decisions on proven facts rather than the piece of information that is most comfortable for our work. That is why we will continue our work to promote and propose scientific evidence as the foundation for our policy proposals. The recently resurfacing discussion on parents refusing to get their children vaccinated – Italy being one of the latest examples of a strict intervention based on scientific results by introducing mandatory vaccination for children. Glyphosate and the way the European Commission handles/d the extension of the approval. Climate Change or any other “fake news” story with Donald Trump at the center of attention. There is a growing concern about a ‘post truth society’ and a belief among some commentators that the public is unwilling to engage with the evidence about complex policy issues. This risks MEPs and the media treating EU citizens as if they don’t care about the truth or accountability. We expect the Commission to use evidence when making policy. We expect commissioners to explain their reasoning. We expect Parliament to seek and to scrutinise reasoning behind policies. Frans Timmermans, first vice president of the European commission and parliamentarians from different political groups have responded to these demands. To make sure that MEPs live up to the citizen’s expectations and go on to seek, scrutinise or use evidence in policymaking, we will help citizens to ask for evidence in EU policy, through our Ask for Evidence campaign and we will organise a citizen-led review to monitor the ‘best and worst’ of MEPs responses over the next 12 months. Dame Anne Glover, Former Chief Scientific Adviser to the President of the European Commission, now Vice-Principal for External Affairs and Dean for Europe, University of Aberdeen. On the 23rd June 2016 the UK voted in a referendum of EU membership and decided by a narrow majority to leave the EU. Only 72% of those eligible voted. The campaign leading up to the vote was remarkable in being almost completely evidence-free. The Remain campaign failed to make a positive evidence-informed case for staying in the EU and the Leave campaign, supported by the tabloid press, flooded the media with misinformation about the EU and used false information to fan citizens fears about free movement of EU citizens in particular. Even now, over 1 year later, there is still a state of denial regarding the impact Brexit will have on the UK and even more worrying, the Government have not published any evidence regarding likely scenarios that might result. This is an unprecedented example of how bad things can get if we turn our back on evidence-led decision-making. The High Level Group of scientific advisors of the European Commission’s Scientific Advice Mechanism (SAM HLG) is unique. It speaks directly with the College of European Commissioners, and works with a consortium of European scientific academies which provide expertise rapidly, and on the widest possible range of scientific domains. It is supported by a well-resourced team in the EC’s Directorate General for Research and Innovation. Transparency is fundamental to the SAM HLG: members are independent of the Commission and appointed in a personal capacity, and the HLG only examines evidence which is in the public domain when producing its advice. Moreover, the SAM HLG is honest about uncertainty and takes care to communicate this to the users of its advice: this is particularly important when evidence is incomplete and when society holds strong views about the issues at stake. The HLG provides advice to the College having been asked to do so, but can also propose advice to the College. To date, it has delivered on request, scientific opinions for climate and cybersecurity policies as well as ‘explanatory notes’ on ‘new techniques in agricultural biotechnology’ and on issues surrounding the regulatory approval of ‘glyphosate’ as an ingredient in plant protection products. Each of these pieces of advice is being considered in the review or development of policies in corresponding areas. The HLG is presently working on scientific opinions on the sustainable use of marine resources and on the regulation of plant protection products. Shortly, the HLG will propose to provide advice to the College of European Commissioners on a number of other topics. All of the activities of the Scientific Advice Mechanism including the minutes of workshops and meetings, as well as all of the products of the HLG, including scientific opinions and explanatory notes are available on the SAM website. Commitment and Courage: We all, but especially also science journalists have to try to do a better job in our daily communication and not be afraid to pick up on controversial subjects. All in all, there is no pointing fingers at each other, we’re all responsible for our democracy and well-being.